Phideaux Fishing on Roanoke Island is one of the only Outer Banks charter fishing operations to offer year-round service. If you’re looking to go offshore in the thick of winter, Captain Jamie Reibel is the one to call. He and brother Jeff Reibel fish full-time for a living — they don't stop after the warm season to move on to something else. Accordingly, their expertise is off the charts, and their system perfected. 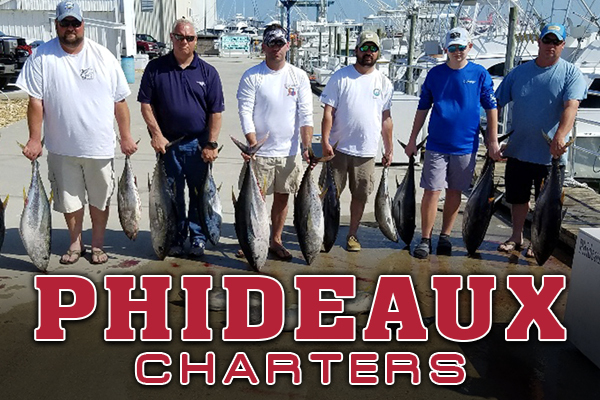 Phideaux Fishing offers full and half-day offshore and inshore charters, as well as bottom fishing trips and sunset fishing cruises. Newly remodeled in 2017, the Phideaux resides in Wanchese at OBX Marina and can accommodate up to 6 passengers. Captain Jamie was Raleigh-born but Outer Banks-bred. He first visited Roanoke island as a small boy with his father with the express purpose of charter fishing. He remembers the painstaking process of developing his sea legs better than he does his first catch, but he returned home fascinated by the sport nonetheless. There was no telling it at the time, but that trip in 1969 would put him on course to become one of the Outer Banks’ charter fishing elites. Jamie continued to fish the Outer Banks summer after summer all the way through college, ultimately moving to the island for good upon graduation. His relationship with the Phideaux fishing vessel began in 1988. It was a brand new, 52-foot Custom Carolina in need of a mate — he was mate-material and in search of a vessel. Jamie spent 7 years on the Phideaux honing in on the nuances of local waters before deciding to embark on the life of a captain. His brother, Jeff, was a shoo-in for mate when he bought the boat in 1995. Phideaux Fishing Charters has been family-owned and operated ever since.